these are the books that I simply couldn't manage without! A new edition of this essential work. Reviewed here. Strengths: These are the two Buildings of England volumes for Norfolk, and it isn't possible to explore the county without them. 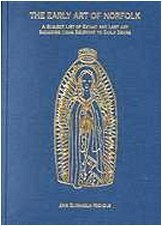 Thoroughly revised by Bill Wilson in the late 1990s, they include every single Anglican and Catholic church from before 1914, as well as a selection of those after, as well as all significant non-conformist churches. They also give references for all the ruins, as well as for some that have now completely disappeared. This is a massive leap forward from the earlier editions, and publishers Yale keep the price low to the extent that you can often find it as cheap as the old ones. The first volume covers about a third of the area of the county, that north of the River Wensum and east of the Stiffkey, including Norwich and Yarmouth. The second volume covers about two-thirds of the area of the county, that south of the River Wensum and west of the Stiffkey, including Kings Lynn, the marshland churches and central Norfolk. Weaknesses: They don't use OS references for sites. With two volumes, having Pevsner and Wilson as a companion can be expensive! 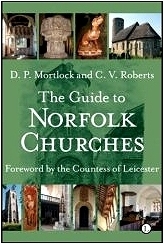 Strengths: Simply, the best reference book ever about the churches of Norfolk. Subtitled A Subject List of extant and lost art including items relevant to early drama, it is a full and accurate catalogue of every single medieval artistic feature ever recorded in a Norfolk church. This huge volume includes all subjects surviving on every rood screen, font, wall painting or sculpture. It also includes those recorded by 18th century and 19th century antiquarians that have now been lost, and even items identified from medieval wills. It is the most complete record of the county's artistic and religious past possible, and is absolutely essential as a guide to identifying features, comparing one with another, and looking up things to track down. It even includes the bosses of Norwich Cathedral. Unputdownable. Weaknesses: Because it is a subject list, you have to look churches up in the index to find their features scattered through the book. It is expensive, but I couldn't manage without it myself. Borrow it from the library first, and become addicted to it!